Join Mouse and Dr. Matt Little to build a WiFi connected development board! This workshop will be on Thursday, 30 November, from 19:00 – 22:00. 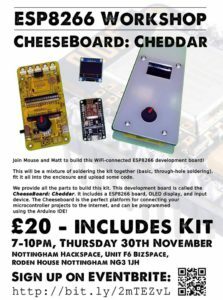 The board is called CheeseBoard: Cheddar, a fully open-source kit from The Curious Electric Company. The board is based on the ESP8266 WiFi system on a chip (the NodeMCU Amica development board) – it’s been designed to try out your ideas quickly and easily, and is a great learning platform for developing ideas on the ESP8266/NodeMCU. 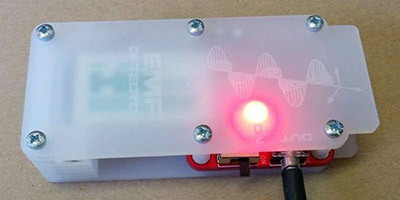 There are also breakout pads for connecting serial data and also a socket for an HC-12 wireless serial module. This workshop will be a mixture of soldering the kit together (just basic through-hole soldering), fitting it into the enclosure, and uploading some basic code. We’ll be providing some basic programs to get started, but if you could bring along a laptop with the Arduino IDE already installed. This workshop will be £20 and tickets are available now and are limited. Nottingham Hackspace’s Annual General Meeting (AGM) will be on Tuesday, 12th December, from 19:00. It will again be at Antenna. This is our yearly meeting, where we discuss the state of the Hackspace over the past year. We will have a full financial report as well as a review of the previous year’s events. For the AGM to have full effect, we need to have a quorate vote to approve the finances. This will require at least 120 members attending. If you cannot make the AGM, you can register a proxy vote, where a person attends and submits a vote on your behalf. We will have a list of members who have volunteered to hold proxy votes in a future email to be sent to members. Or, if you know someone who is attending, you can ask them to be your proxy. Thank you for being a Hackspace member this past year, and we look forward to see you at the AGM! Conceptualise and create projects with no value whatsoever! Create a problem no one has! 12:00PM – It starts! There’s a spiel! You can use things! Go! 7:00PM – You’re done! Stop making stuff! Eat food! Work individually or in teams. Spectators also welcome! 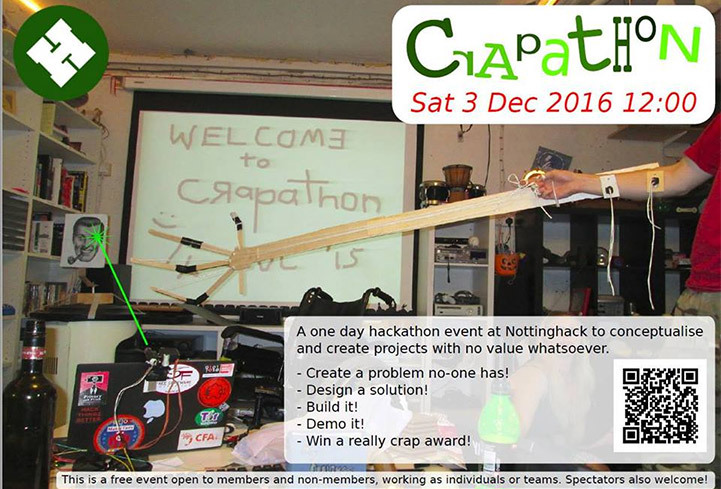 Are you a Nottingham Hackspace member? Have you wanted to help out? Have you wanted to join a team, but wasn’t sure how? Have you wanted to have a nice meal with nice people and find out how to help? We’re having a Team Social on Saturday, 30 September. Starting around noon, this will give you a chance to find out about the various teams, ways you can volunteer at the space, and get involved! This is also a potluck event, so bring along a nice dish and plenty of enthusiasm! Every Tuesday night, our brave group of volunteers spend their evening developing the downstairs of Hackspace 2.5. Would you like to help out with Hackspace 2.5? 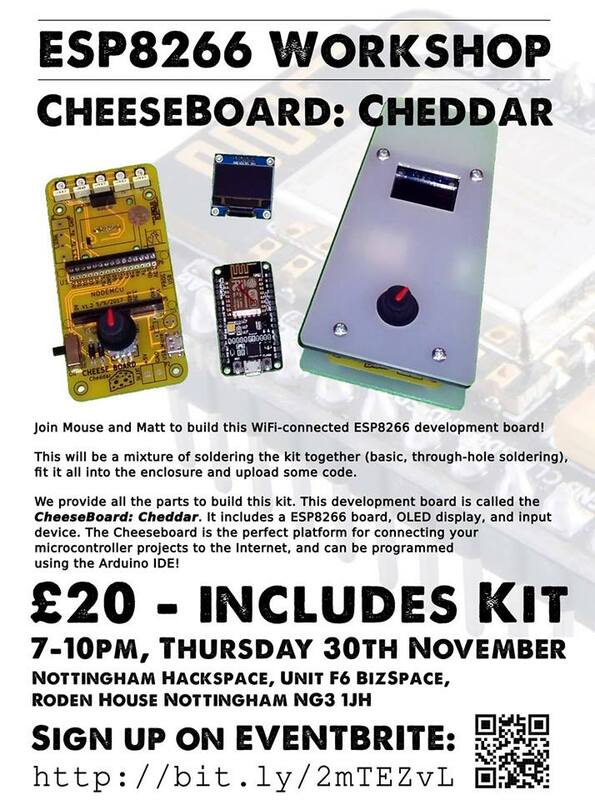 Come along on Tuesday night, or find out more on the #hackspace2point5 channel on the Nottingham Hackspace Team Slack (available to members via HMS). Nottingham Hackspace is happy to host the next Notts Dev Workshop on Friday, 4th August, from 5:30pm until 8:30pm. DevOps (a portmanteau of “development” and “operations”) is a software development and delivery process that emphasises communication and collaboration between product management, software development, and operations professionals. In this workshop, Matteo Emilli will be helping attendees put a small application in the cloud, including the creation of a pipeline, the definition of your Infrastructure as Code, the packaging process, and the release. More advanced practices will also be discussed, like silent deployments, feature flags, and the use of telemetry in your application. Matteo is an Application Lifecycle Management and DevOps advisor, as well as a Microsoft MVP for Visual Studio and Development Technologies, with a passion for Agile Methodologies and Processes. 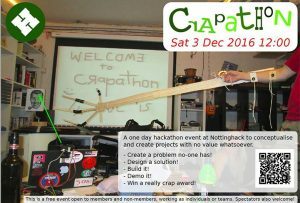 Join the Nottinghack Crapathon on Saturday, 3 December! Learn to make your own soap using the traditional cold process method on Sunday, 19 June, from 1:00 – 4:00. You’ll be able to create your own six-bar block of coloured and scented soap from a mixture of coconut oil, lard or palm oil, olive oil, and lye water. You pick the scents and colours. All materials are supplied, and you get to keep the mould to re-use again. Detailed written instructions and recipes are provided, and you’ll also learn how to adapt recipes or create new ones using online soap calculators. Information on packaging, labelling, and selling legislation will also be included, if you’re thinking of starting your own soap business. Tickets are £27.57, including Eventbrite themes, and are on sale now. Please note: The lye water (sodium hydroxide solution) is very caustic, so goggles and gloves must be worn while the soap is in a liquid state. Please wear old clothes or a lab coat.